The new PHEV does not look too different from the previous car, but it is under the skin, and it’s the things you can’t see that have changed. 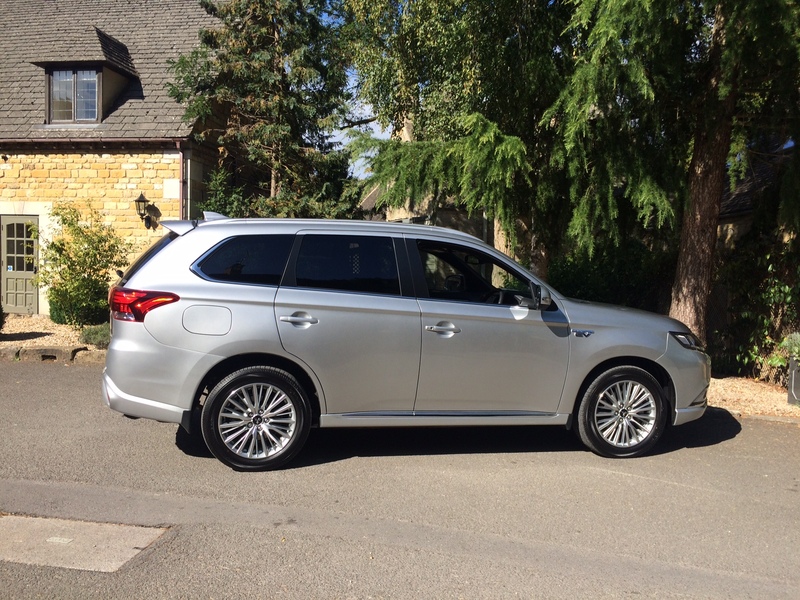 The Outlander PHEV was first launched in the UK in 2014, and a lot of people, including me, really couldn’t see what all the fuss was about, and if it really needed a 2.4 petrol engine 4x4 SUV and also if it would sell. This was in the day when diesel ruled, and there really was no point, and no advantage in buying a petrol, or much appetite for large, non-diesel cars. Diesel was here, and here to stay, so this new-fangled, plug-in petrol SUV, really should not stand a chance. Mitsubishi is a relatively small manufacturer so to take on the big-boys with new technology was going to be a real challenge. But against all the odds Mitsubishi sold more than 10,000 of these plug-in Hybrids, and compare this to 2013 where less than 1,000 plug-in’s were sold in total, by all manufacturers, so quite a good success for the first year. 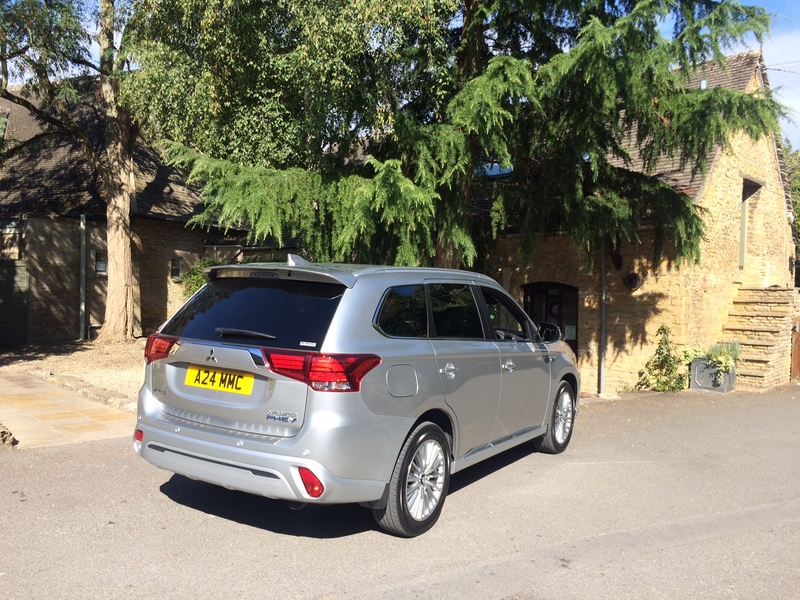 This new Outlander is powered by a 2.4-litre Atkinson cycle petrol engine that produces 135ps and goes from 0-60 mph in 10.5 seconds. This new engine replaces the outgoing 2.0-litre petrol engine that produces 121ps, and goes from 0-60 mph in 11 seconds. It is the same engine block, but bored out more to give it more power and a smoother delivery. The rear electric motor has also been given a boost, and goes from 82hp to 95hp (not sure why the engine is in ps and the motor is in hp, but there we are). We left the hotel and the car was in EV Mode, which meant it would only drive in electric power, unless you really put your foot down, then the petrol engine would kick-in. The car was fully charged, after being plugged in all night, and after driving it fairly steadily, the car made it to the morning tea and cake stop which was just under 30 miles, without using any petrol, and there was still 4 miles left in the battery. This range of around 30 miles on pure electric may not sound a lot, and it probably isn’t, but many people only cover this sort of mileage on a daily basis, so does make sense to them. But those who cover a larger daily commute and use up that electric fairly quickly, then this PHEV seemed to be pretty good on fuel. On such a short test drive in a day, it was difficult to get an average figure, for fuel use only, but I guess after the electric has gone, and it is on petrol only, you would get 35-40 mpg quite easily. 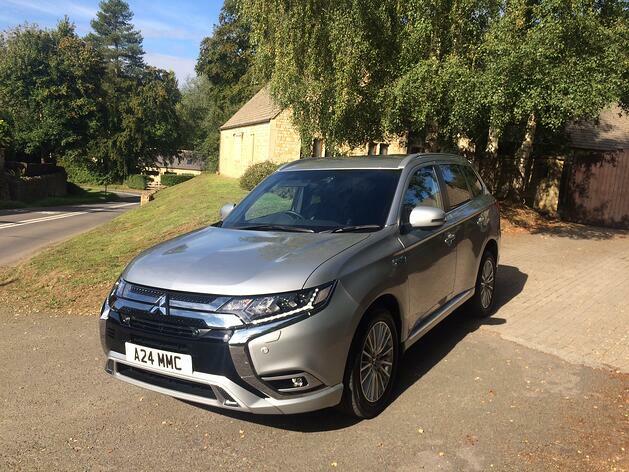 But as you are driving on petrol the Mitsubishi’s clever system is constantly charging the battery when it gets chance, such as on deceleration, coasting, or going down hills. The dial in front of the driver tells you exactly what is happening all the time. And as you drive, you do try and re-charge as much as possible, it is one of life’s little mysteries that when driving a ‘green’ car, you try and be as green as possible. When you are not driving a green car, you don’t really care, you just drive it normally. If you drove 28 miles per day, only used electric power and did this for a year you would do over 10,000 miles using no petrol at all, which in reality is unlikely but the trip computer would show 10,000 mpg, I know, I know… highly unlikely ..!! Models offered are: Juro, priced at £34,255 OTR including £2,500 plug-in grant, 4h costs £37,000 and is likely to be the best seller, 4hs - £39,100, 5h £41,000 and the top of the range 5hs costing £43,100 – these prices are the same as the outgoing model, so no premium has been added for the more refined car, with improved technology and specification. The 4h model comes with a good list of standard equipment including: 360-deg camera, leather seats with 8-way electric adjusted drivers seat, Blind Spot warning, rear cross traffic alert, power tailgate, heated steering wheel, LED headlamps with self-levelling, heated windscreen, heated front seats, cruise control, reverse camera, electric Pre-heater with air-con function, and much, much more. The Outlander has lots of attributes, and is very clever, it is a good-sized SUV with loads of rear leg-room, and a large boot, it is a four-wheel drive, it is pleasant to look at, and you would never be embarrassed to arrive in it, or be seen in it, it is full of goodies and standard spec. But the most important thing to many people is the low emissions story, the all-important C02 numbers are: 40.3 g/km on the NEDC testing system, and 46 G/km on the new WLTP testing procedure, so for company car drivers who pay tax, it is a very efficient car to use for business. 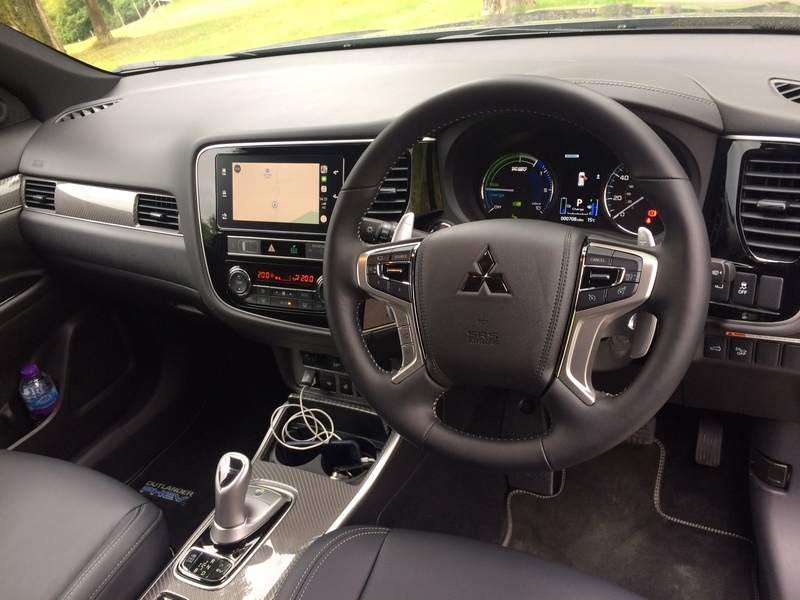 The new technology and improved systems on this plug-in SUV really are very good and you can tell that Mitsubishi has just about thought of everything. Back in 2014 when diesel ruled, and petrol was virtually unwanted on larger cars, who would have thought that a plug-in petrol SUV would be a very desirable car to own. Mitsubishi I’m sure would say it was all very carefully planned.